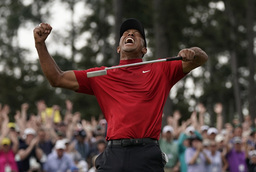 LAS VEGAS (AP) A Wisconsin man who claims to have never placed a bet on sports before he risked $85,000 on Tiger Woods winning the Masters is now more than a million dollars richer. Adducci flew back to Las Vegas on Monday. Joined by Asher and SLS casino-hotel general manager Paul Hobson, he smiled while posing for pictures holding the check for $1.275 million - his original stake plus the payout of $1.19 million. Adducci said he is now considering using the money for other bets.